J Reed 1995 Cherub Angel With Violin Christmas Ornament. Created in 1995 and offered for sale at Geary's, Cherub Angel With Violin by J Reed & Sons was part of a collection of 3 sterling silver angel ornaments. It is in very nice, lightly used condition. It measures approximately 5 1/4 inches tall, 3 inches wide and weighs 130? This lovely is 3D ornament on the front, but has a flat back with loop for hanging. It is simply stamped 925 on the side. 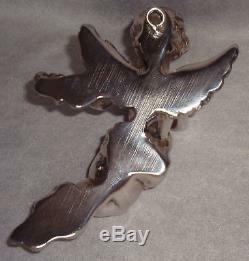 It is featured in a photograph on page 94 of Clara Scroggins "Silver Christmas Ornaments" book. As with all vintage silver, may exhibit light scratches consistent with use and polishing, and may require proper polishing upon receipt depending on your preferences. If by some small chance your item is not satisfactory, your return should still be received within 7 days or less. Per Clara Scroggins in Silver Christmas Ornaments book, These sterling silver cherub ornaments are created by employing a uniques process to hand-craft each musical cherub. Working in precious sterlling silver and adding carefully, rich sculptural details to wings and Renaissance musical instruments, and finally hand polishing and buffing to a rich luster is how J.
Reed & Sons create these lovely ornaments. Be sure to check my other listings for more limited edition and collectible ornaments plus most brands of popular Christmas sterling pendant /medallion / ornament / charms, and other great gift items, Victoriana, Elegant Glassware, Vintage Clothes and Shoes etc. 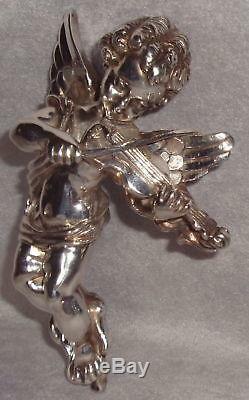 The item "J Reed 1995 Sterling Silver Cherub Angel Violin Xmas Ornament Pendant Medallion" is in sale since Monday, January 13, 2014. This item is in the category "Collectibles\Holiday & Seasonal\Christmas\ Modern (1946-90)\Ornaments\Metal".